Are You a “Rule Maker” or a “Rule Breaker”? It’s 11:00 p.m. in Berlin. Not a single car is in sight, yet a pedestrian waits patiently at the crosswalk until the light turns green. Meanwhile, four thousand miles away in Boston, at rush hour, commuters flout the “Do Not Cross” sign as they dart in front of cabs. To the south, where it’s 8:00 p.m. in São Paulo, locals are frolicking in string bikinis in public parks. Up in Silicon Valley, it’s mid-afternoon and T-shirted employees at Google are playing a game of Ping-Pong. And in Zurich, at the Swiss bank UBS, which for years mandated a forty-four page dress code, executives burning the midnight oil have barely loosened their ties. We may tease Germans for being excessively orderly or Brazilians for showing too much skin, but we rarely consider how these differences came about. Far beyond dress codes and pedestrian patterns, people’s social differences run deep and broad—from politics to parenting, management to worship, and vocations to vacations. In the past several thousand years humanity has evolved to the point where there now exist 195 countries, and more than seven thousand languages and many thousands of religions. Even within a single nation, such as the United States, there are countless differences in fashion, dialect, morals, and political orientation—sometimes among those who live in close proximity. The diversity of human behavior is astonishing, especially since 96 percent of the human genome is identical to that of chimpanzees, whose lifestyles, unlike humans, are far more similar across communities. We rightly celebrate diversity and condemn division, yet we’re shockingly ignorant of what underlies both of these things: culture. Culture is a stubborn mystery of our experience and one of the last uncharted frontiers. We’ve used our big brains to accomplish unbelievable technical feats. We’ve discovered the laws of gravity, split the atom, wired the Earth, eradicated fatal diseases, mapped the human genome, invented the iPhone, and even trained dogs to ride skateboards. But somehow, despite all of our technical prowess, we’ve made surprisingly little progress in understanding something equally important: our own cultural differences. Why are we so divided, despite the fact that we’re more technologically connected than ever? Culture is at the heart of our divisions, and we need to know more about it. For years, policy experts and lay-people alike have struggled to find a deep underlying factor to explain our sprawling, complex cultural traits and distinctions. Many times we focus on superficial characteristics that are the “symptoms of culture.” We try to explain our cultural divides in terms of geography, thinking that people behave the way they do because they live in blue states or red states, in rural or urban areas, in Western or Eastern nations, in the developing or developed world. We wonder if culture can be explained by differences in religion or our different “civilizations.” These distinctions have typically left us with more questions than answers because they miss the deeper basis of our differences—they don’t get at the underlying primal template of culture. A more compelling answer has been hiding in plain sight. Just as simple principles can explain a whole lot in fields such as physics, biology, and mathematics, many cultural differences and divides can be explained through a simple shift in perspective. Behavior, it turns out, largely depends on whether we live in a tight or loose culture. The side of the divide that a culture exists on reflects the strength of its social norms and the strictness with which it enforces them. All cultures have social norms—rules for acceptable behavior—that we regularly take for granted. As children, we learn hundreds of social norms—for example, to not grab things out of other’s people’s hands; to walk on the right side of the sidewalk (or the left, depending on where you live); to put on clothes each day. We continue to absorb new social norms throughout our lives: what to wear to a funeral; how to behave at a rock concert versus a symphony; and the proper way to perform rituals—from weddings to worship. Social norms are the glue that holds groups together; they give us our identity, and they help us coordinate in unprecedented ways. Yet cultures vary in the strength of their social glue, with profound consequences for our worldviews, our environments, and our brains. Tight cultures have strong social norms and little tolerance for deviance, while loose cultures have weak social norms and are highly permissive. The former are rule makers; the latter, rule breakers. In the United States, a relatively loose culture, a person can’t get far down their street without witnessing a slew of casual norm violations, from littering to jay walking to dog waste. By contrast, in Singapore, where more violators are rare, pavements are pristine, and jaywalkers are nowhere to be found. Or consider Brazil, a loose culture, where clocks on city streets all read a different time, and arriving late for business meetings is more the rule than the exception. In fact, if you want to be very sure someone will arrive on time in Brazil, you say, “com pontualidade britânica,” which means “with British punctuality.” Meanwhile, in Japan, a tight country, there’s a huge emphasis on punctuality—trains almost never arrive late. On the rare days that delays to occur, some train companies will hand out cards to passengers that they can submit to their bosses to excuse a tardy arrival at work. For centuries, people assumed there were as many explanations for these cultural permutations and rifts as there were examples of them, but there is a deep structure that underlies cultural variation. A pivotal discovery is that the strength of a culture’s norms isn’t random or accidental. It has a hidden logic that make perfectly good sense. Intriguingly, the same tight-loose logic that explains differences across nations also explains differences across states, organizations, social classes, and households. Tight-loose differences emerge in boardrooms, classrooms, and bedrooms, around negotiating tables and dinner tables. Seemingly idiosyncratic features of our everyday lives—including how we behave on public transit and at the gym, and the kinds of conflicts we have with our friends, partners, and children—all fundamentally reflect tight-loose differences. Beyond our immediate community, tight-loose differences can explain global patterns of conflict, revolutions, terrorism, and populism. Around the world, tight-loose operates as a universal fault line, causing cultural cohesion to buckle and rifts to open up. The rifts aren’t just blared in headlines; they surface in daily interaction. Tight-loose not only explains the world around us, but actually can predict the conflicts that will erupt—and suggests way to avoid them. Tight-loose is the key to anticipating our divides—mild clashes, in the case of a construction worker rolling his eyes at a gold cuff-linked Wall-Streeter, or more lethal ones, such as when those who live by the tenets of sacred texts come in contact with those who dismiss guiding texts altogether. Are you a rule maker or a rule breaker? 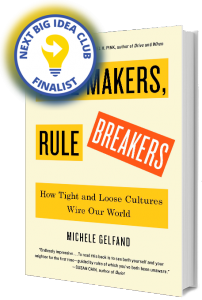 Excerpted from Rule Makers, Rule Breakers: How Tight and Loose Culture Wire Our World by Michele Gelfand. Copyright © 2018 by Michele Gelfand and Simon & Schuster, Inc. Excerpted with permission by Scribner, a division of Simon & Schuster, Inc.